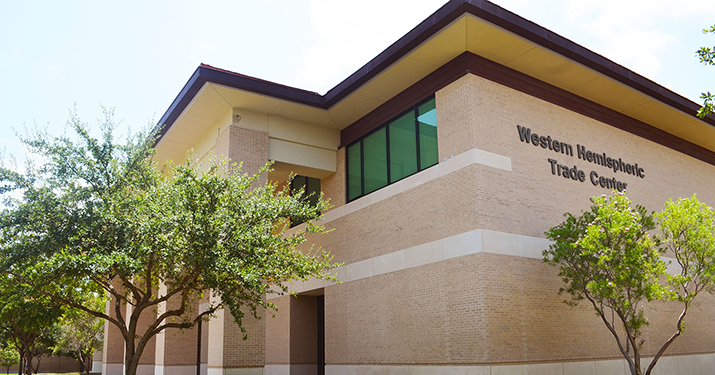 The Center for the Study of Western Hemispheric Trade at Texas A&M International University is a public service institute founded to study globalization with special emphasis on the Western Hemisphere. The Center is a part of the A. R. Sanchez, Jr. School of Business. The Center seeks to increase awareness and knowledge about the Western Hemispheric countries and their economic, political, and social interactions. The Center for the Study of Western Hemispheric Trade is a unique, leading research facility that along with its allied components and key contacts throughout the Western Hemisphere provides current and relevant information about issues dealing with trade and commerce that affect its constituents in the Hemisphere. The Center for the Study of Western Hemispheric Trade at Texas A&M International University has as its mission to study and promote research on globalization with special emphasis on the Western Hemisphere. The Center will aim to increase awareness and knowledge about the Western Hemispheric countries and their economic, political, and social interactions. The Center will also spotlight Texas A&M International University and the City of Laredo as key resources of information, research, training, and conferences focusing on the Western Hemisphere. Consistent with the mission of the A. R. Sanchez, Jr. School of Business, the Center will promote education and teaching through its various programs. The Center’s research focuses on subjects that affect Western Hemispheric Trade, including trade agreements, tariffs, customs, regional and national economies, politics, business development, finance, the environment, and culture. The Center’s publications include The International Trade Journal, a refereed, interdisciplinary journal whose purpose is the enhancement of research in international trade and associate areas of international business and political economy. Additionally, the Center hosts an online Working Paper Series which provides a forum for disseminating works-in-progress reflecting the broad range of research activities of Texas A&M International University’s A.R. Sanchez, Jr. School of Business faculty members and Ph.D. students.